Our excitement grew as we approached the Museum of Flight. We could see planes parked all around the building and parking lot. My 11-year old step son quickly dropped the DS and became interested in looking around us. Tell your son we are going to a museum - not so interested. Tell your son we are going to a museum where he can sit in the cockpit of a fighter jet - interested! 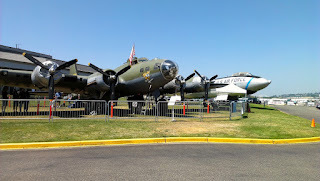 The Boeing Museum of Flight is one of the largest flight museums in the world. 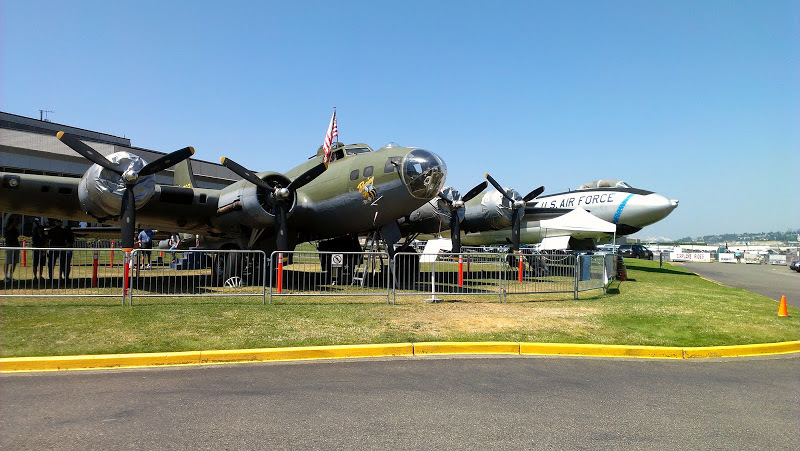 It hosts over 150 historically significant planes and space crafts, includes the Red Barn (the original Boeing manufacturing site) and serves more than 400,000 visitors annually. We spent over four hours at the museum and saw less than half of the exhibits! We went straight to the modern era, as we were lured by rockets and the history of space flight. If you are only going to see half of the museum, this was a good half to see. We promised our step-son we would return next year to check out the other half. We had a real blast. There are so many hands on activities. For younger kids, they have a separate little play area that looked from the outside to be geared towards younger children. However, all three of us enjoyed hanging out in there! It had lots of hands on information about materials, a hang gliding simulator, a hot air balloon, and some small aerodynamic models. In a hallway in route to the flight control tower, there is a hallway lined with videos on the history and origins of flight. We could have spent all afternoon watching those videos, but after spending hours before getting to them, we were too tired to keep standing and had to press on. The largest room in the modern section houses a ton of original planes, both parked on the ground and hanging from the ceiling. It's an adventure just exploring this one room. Several planes are open to walk inside of or climb into the cockpit. Smaller rooms showcase the history of space travel. In one room, you can actually walk into a replica of a section of the international space station and see how they work and sleep in space. Several volunteers were available to ask questions. These volunteers had a history of working in the industry and wore badges asking us to ask them questions. Overall, the whole museum was inviting for hands on learning and interaction. Perfect for an 11 year old boy! There were several types of simulators spread throughout the modern flight exhibit. These were the highlights of my son's experience. He did the hang glider simulator, moon lander simulator, EVA simulator plus the two flight simulators. 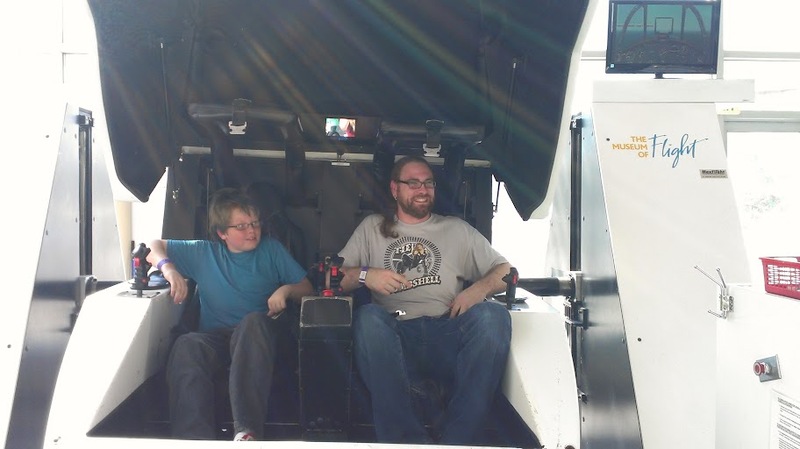 My fiance and son getting out of the second flight simulator. The first flight simulator we did (all three of us!) was a "4D" simulator that was similar to a roller coaster/theater type simulator. We wore 3D glasses and sat in roller coaster type seats on a platform that moved in two axis parallel to the ground. The simulator ran like a movie and simulated a fighter pilot performing a mission. After the simulation, my fiance and I were both incredibly nauseated! Luckily, seats were strategically placed for people exiting the simulator. The second flight simulator is a two person manned vehicle. One person flies while the other can either be a passenger or shoot enemies. My fiance really didn't want to do another flight simulator, but my son was so eager to do it, they decided to give it a go. Lucky for me, I got to observe only. This simulator required training, since the participants actually get to maneuver the "vehicle" and interact with the simulation. The simulator was able to spin 360 degrees around two axis, a horizontal axis and a axis through the nose and tail of the simulator. I watched as they spun upside down, dived straight down and climbed straight up. So glad I wasn't in that simulator! My fiance said it wasn't so bad, as long as you were the one in control. As soon as he gave control to our son, he almost instantly felt motion sick and took the controls back. That's OK though; my son enjoyed shooting down enemy planes. The simulators are better suited for older kids. I watched a very young child who just barely made the height/weight requirement back out once he was actually in the cockpit of the second simulator we tried. He started crying while his older brother was just grinning with excitement. Unfortunately, the simulator does require 2 participants, one willing to drive. Thankful for the older brother, an employee was willing to ride with him. The dad did not want to ride (I don't blame him!). Balsa wood glider - pick them up at the gift shop! Don't forget to leave time to shop! We arrived at the gift shop right at closing time (sorry!). The gift store is an experience in itself. They have lots and lots of toys, models, accessories, clothes, science kits, and more! Make sure to get your kids these wooden gliders (pictured to the left). They are $2 and are hours of entertainment! Might want to pick up a spare, as my son broke his within a few minutes and was given his dads. The broken one actually still flew, but you know how kids are about broken things! Make sure you fly them in a large grassy area. My son and fiance were trying to do it in the street in front of our apartment, but stopped early as they were scared they might breaking something. We also picked up a model plane as a souvenir for my son. These models are meant for looking only, not playing. My son discovered that as his model came apart within a few minutes of playing with it. I super glued it back together and now he knows. That's why it was great to buy the glider in addition, as it was something he could play with for hours on end! We also picked up a couple post cards, as we have decided to start a collection of post cards from our summer activities. I'm going to write the dates on them and maybe make a memory book of them. Post cards are so cheap, so they are a great collectors item! Flight Activities - flight simulators, learn to fly, aviation learning center, jet city air tours, old thyme aviation or fly your own plane to the museum! Low on funds but really want to go? The first Thursday of every month from 5-9 p.m is FREE!